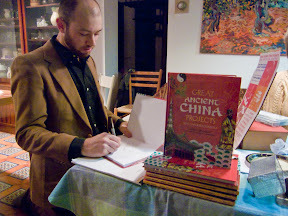 Author Lance Kramer and illustrator Steven Weinberg, creators of the children’s story book “Great Ancient China Projects You Can Build Yourself,” visited Bethesda Elementary students to speak about their careers Dec. 2. Bethesda Elementary staff felt the visit would be an educational experience for students. The visit focused on engaging students in reading and writing. Kramer and Weinberg initiated the visit after expressing interest in speaking to the students. Students learned a lot about literature as well as China itself. “They learned things about China’s history and culture, the importance of persistence to reach a goal and about the writing and illustrating process,” says fourth grade teacher Christine McCord. Many teachers were also impressed by the presentation and felt that the students learned a lot. Parts of the presentation also focused on how even students have the potential to write novels.